Set the stage for an unforgettable youth. Epitomizing the savings of purchasing outdoor playsets for your own backyard, the Opening Star playset is your classic combination of a safe playset and fun. Whether you're thinking economically in terms of price, or are just working with an economy of available space in your yard, the Opening Star may be a perfect fit. 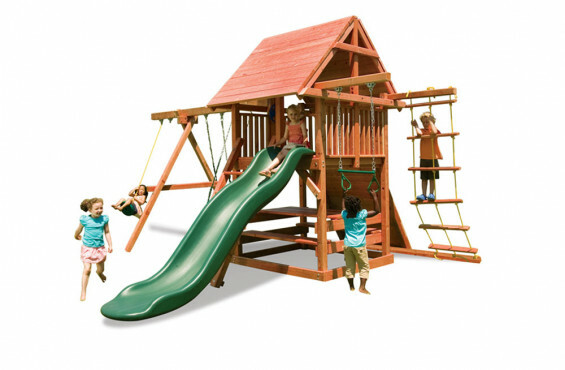 The unique configuration of this playset includes two swings, climbing rock wall and ladder, though it's easy enough to add extensions for accessories like a rope-ladder or trapeze bar. The lower level picnic table literally doubles the usable space of the tower, giving you the most bang for your buck. Included in the price are all the usual safety features and guarantees that you expect from Kids Creations - quality, safety and savings from our family to yours. Unlike other manufacturers, we only use 100% California redwood. 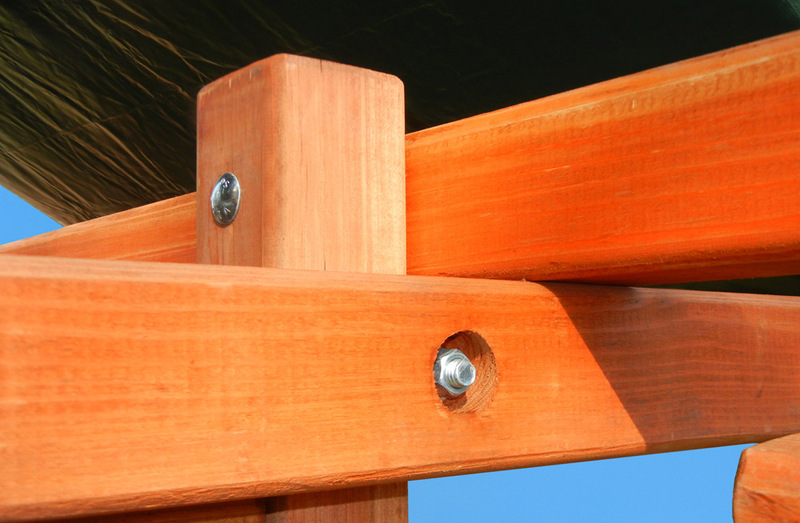 Not only is redwood resistant to the elements, it requires minimal maintenance and is virtually splinter-free. 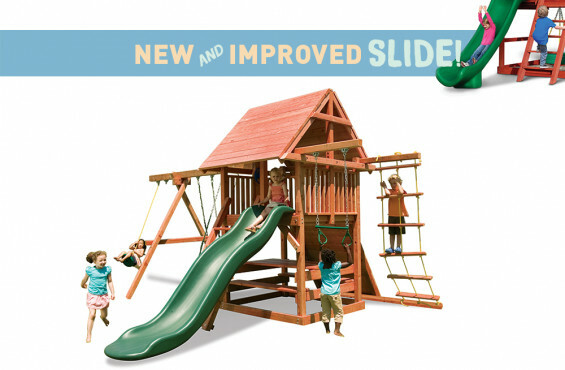 We design our outdoor playsets to bring the excitement of the common playground to backyards across America. However, we have become the most respected playset manufacturer in the U.S. by putting safety first, always. As an active ASTM safety committee member, we have gone beyond the normal safety guidelines to ensure your children are always safe. Here are the safety features included on our playsets. While our outdoor playsets are hand-crafted to eliminate unnecessary cuts and scrapes, we suggest adding a fall surface under your play structure to add another layer of protection for children – just in case they lose their balance and fall. We recommend to add rubber mats, rubber mulch, wood chips sand or pea gravel under your playset. To see a pros and cons list of the best materials for under a playset, check out the resources tab on this page. For a detailed guide on playset fall surfaces, be sure to check out our resources tab on this page. This outdoor playset is not intended for public use. 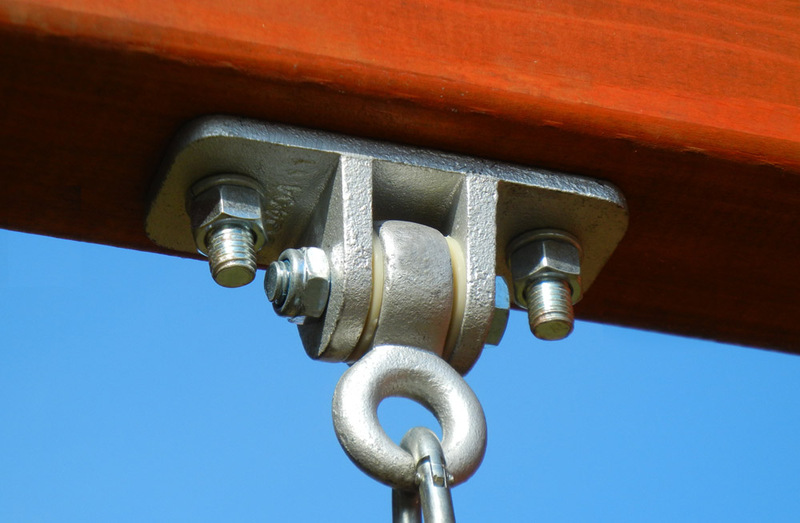 It is intended for residential use and is not warrantied for public or commercial use. 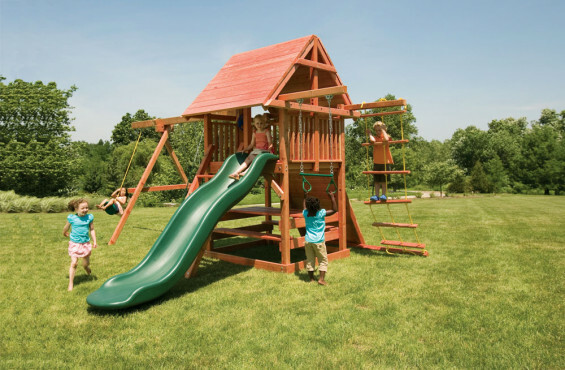 Once your playset is built and ready to ship from our shop in Monroe, MI, the delivery company will contact you to schedule a delivery date and time. The typical swing set will be delivered curbside and comes in multiple bundles/boxes. Some larger packages may need to be opened and hand offloaded to the ground. It might be helpful to have another person help you bring the components into your backyard, but it not a necessity. Periodic maintenance is suggested to ensure safe enjoyment of your playset and optional accessories. Be sure to check out our outdoor playset maintenance checklist within the resources tab on this page. The Opening Star playset is factory stained to provide a beautiful finish and long lasting protection. We recommend staining wood playsets once a year to maintain its rich color and naturally resilient qualities. Prior to staining, clean all wooden components. Use a high quality water based stain or sealant such as Thompson’s Water Seal® . After staining or sealing, please allow 24 hours to dry before allowing children to start their adventure. We've owned our swing set for almost 5 years. Unfortunately the set up we have was a custom but it is roughly the same style as the Opening Star. This swing set is as high of quality product as any of the name brand (Rainbow or comparable) swing sets you will find on the market. Trust me we did our research for months before buying. We had it put together in one day and it has been used constantly over the last 5 years. We have several kids in our family ages 14-3 and I can tell you they look like ants at a picnic on this thing. It has never faltered. Nothing has broken nor has any of the wood warped. There is no need to spray any kind of stain or waterproofing on the wood. Most higher end swing sets require some kind of annual treatment. The true test came on May 20 2013. We were victims of the Moore OK Tornado. The Tornado passed roughly 200 yards from our house. Our fence, pool, roof, sheds had some kind of wind damage from the storm. When I surveyed the damage in backyard that swing set didn't move. Even the tarp was still intact. (remember this set is 5 years old and we have not replaced anything) About the only damage to the swing set that I coiuld see was one of the buttons holding the tarp to the wood came loose. With a quick snap it was like it never happened. The fencing around our backyard was pulled up by the concrete post anchor in the ground if that gives you any indication of the wind speeds during the tornado. We have several friends who bought "cheaper" sets and their's were completely leveled or picked up by the wind. This was a true test of the durability of the set. I would recommend this company and any swing set they build.